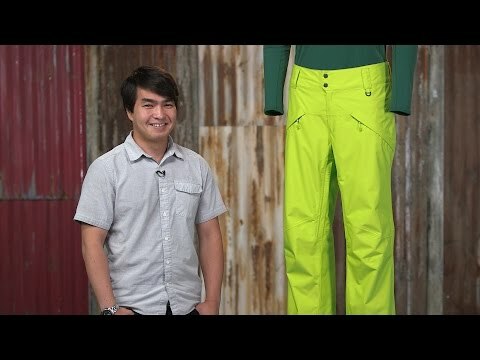 Ride through hero runs and sketchfest survival conditions with these durable, motion-primed pants. They offer 2-layer waterproof-breathable protection and ride-ready features like internal gaiters, kick patches (to stop your edges from slashing them) and attachments loops for the powder skirt on you jacket. Mesh vents on the thighs allow you to let off steam on an uptrack and the smooth interior lining won't snag on your base layers. H2No® Performance waterproof-breathable shell is durable polyester, treated with a DWR finish for exceptional rain protection. Lightweight mesh lining in the legs glides over layers and breathes well. Brushed microfleece waistband wicks sweat and has elasticized hook and loop tabs to customize the fit. Mesh lined inner thigh vents allow heat to escape and prevent snow from getting in. 2 zippered mid-thigh cargo pockets hold small essentials. Internal gaiters have a boot hook and a DWR finish to seal out snow. Kick patches protection from abrasion.